Extruded expanded polystyrene (XEPS) is a closed-cell foam insulation similar to MEPS. Foam densities are typically 1.5 pounds per cubic foot. The R-value depends upon the density of the material and is generally about R-5 per inch. It's also much more consistent in density and has a higher compressive strength , making it better suited for use on roofs or for wall panels. Extruded polystyrene also has excellent resistance to moisture absorption. Polyisocyanurate and Polyurethane Foam Board. 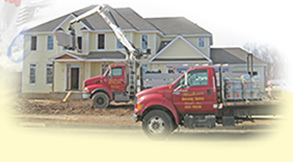 Polyiso foam board insulation is available in a variety of compressive strengths. Compressive strength refers to the ability of a rigid foam board to resist deformation and maintain its shape when subjected to a force or load. Also, polyiso remains stable over a wide temperature range (-100 F to +250 F). This makes it good as roofing insulation. And when used with a laminated aluminum foil facing, polyiso foam board provides an effective moisture or vapor barrier. 4x8' Prescored 16" and 24"